A work that I just finished. Inspired by all the graffiti writers and graffiti works I’ve met and seen. Yet another one the “graffiti/tattoo” works that I did long time ago, in 2009 if I’m not wrong. It was to be my “signature”, but I realised that it was a bit too complex for me to redo. The words that have been hidden is my full name. As for the visuals, they are spontaneous and I just let my juices flow. Certain elements are still used in my drawings today, so I could say this was one of the works that led to my “style” now in my sketches and drawings. This is one of the works that I did long ago but am still willing and proud to display. I shall be posting a “concept” drawing of my work-in-progress soon. It is similar to the “tattoo designs that I have done over the past few years, but more structured and abstract. This is drawing using pencil on a A3 size paper roughly two years ago. However it was never completed fully. I decided to make add graffiti to actual fixed shapes and during that period of time, where I was really interested in cards. I was going to make a series of all the aces, in dedication to friends and personal interest. However it never got realised and i did not even finish the ace of hearts. In this drawing, I combined the technique I use a lot in the drawing – hiding words inside my drawings. But usually they are very, very tough to find. 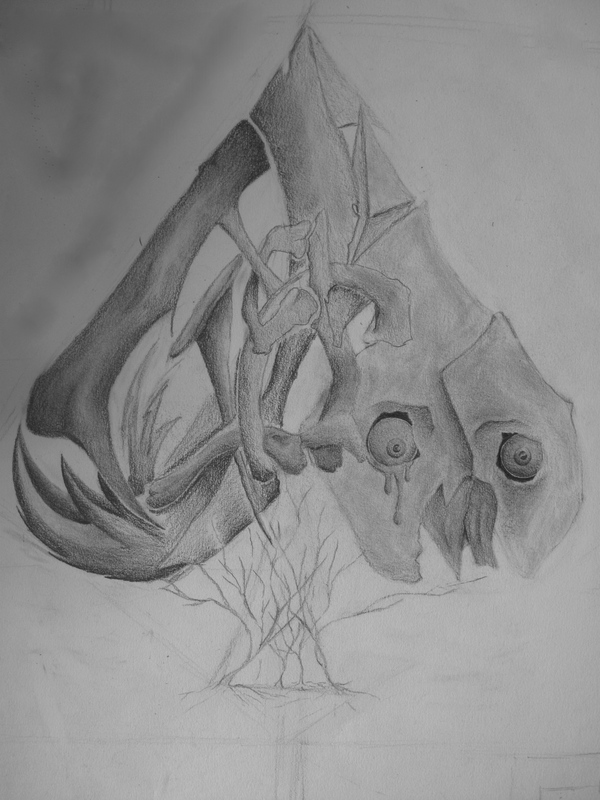 It was also a practice of my shading and tonal techniques, and I gradually got better due to these imaginative drawings rather than still-life drawings. I stopped drawing this style for a due to time constrains and trouble actually finding links with my sculpture practice. But now, I am gradually finding links with them and starting to draw them more again. I will be posting more of these works online and they will range from recent works and sketches to those that a made years ago. This is the year-end final art piece for drawing. This piece’s theme was popular culture and I took graffiti to be one of the many forms of popular culture. In this work, I tried to challenge the use of graffiti by veering it to the more original drawing style. This piece is a one continuous line drawing and the four words represent my idea of graffiti and what stimulates people to do such things. There is also a play on word linking the relation of gang influence and feelings. The unclear style also relates back to the normal style of graffiti, where words may be unrecognizable and not make sense. However, it changes the idea of normal graffiti and brings it to a more formal, fine-arts method, thus allowing it to be on the blur of the line between classical drawing styles and street styles. This piece of art was made to represent different types of meanings to different viewers, thus the title imagination. In my eyes, I have 2 different ways of interpreting my work. Take note that this 2 pictures both contribute to the same meaning and the same concept and is taken as one artwork. My first interpretation is, this is the lifestyle of two different people, birth to death. The one on the right shows a wild lifestyle, a person who is not brought up on the right values and who is not given the love and attention he or she needs. The reverse side shows the total opposite, a person who is brought up with the values and given love and affection, but not spoilt. The second interpretation the connections of fantasy elements fire, water, wind, fire, nature, ice, light and darkness.